Rio de Janeiro sits in a beautiful spot surrounded by abundant nature and incredible beaches. 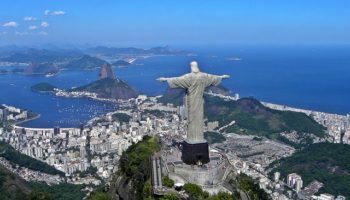 It also boasts the iconic ‘Christ the Redeemer’ statue, as well as the cable car that takes travelers to Sugarloaf Mountain and its amazing views; this is a city that is truly bursting with the vibrancy of life. Home to the world famous sandy beaches of Copacabana and Ipanema, where days on the sand can be spent rubbing shoulders with the city’s bold and beautiful, parading along the shore and enjoying all the good things that life has to offer. Fun and festivities can always be had, especially during carnival time! Great food and high-class dining are on offer in upmarket Leblon, and trendy Botafogo’s youthful mindset is steering Rio in a new, fashionable direction. Rio is a playground for people to get stuck into and enjoy what they love the most, from fantastic hiking opportunities in the surrounding hills to dancing until the sun comes up in the many nightclubs. With accommodation that ranges from very affordable to luxury, there’s a spot for everyone to enjoy this colorful, frenetic, and forever alive city. The famous area of Copacabana is well known the world over for its equally renowned beach – Copacabana beach. A perfect arc of white sand meeting azure seas, it’s edged by a palm-lined promenade on a backdrop of white, high-rise buildings, with monolithic rocks jutting out of the jagged coast – of which the famous Sugarloaf Mountain is just one. Two and a half miles long, the beach here is vibrant and full of life. It’s a great place to play sports, swim, sunbathe – and be seen. It’s famous for its New Year’s Eve parties, where millions of people attend and local hotels sponsor a vast array of fireworks for the festivities. Elsewhere, Copacabana is dotted with trendy rooftop bars and upscale restaurants, plus interesting areas like Barrio Peixoto, filled with Art Deco architecture. Located in the heart of Rio’s South Zone, this lively and wealthy barrio has thrived on rich Brazilians as much as tourism, part of this area ever since the 1923 opening of the Copacabana Palace Hotel (still open – and still luxurious). Today, it’s crawling with places to stay, from cheap backpacker hostels all the way to luxury hotels. 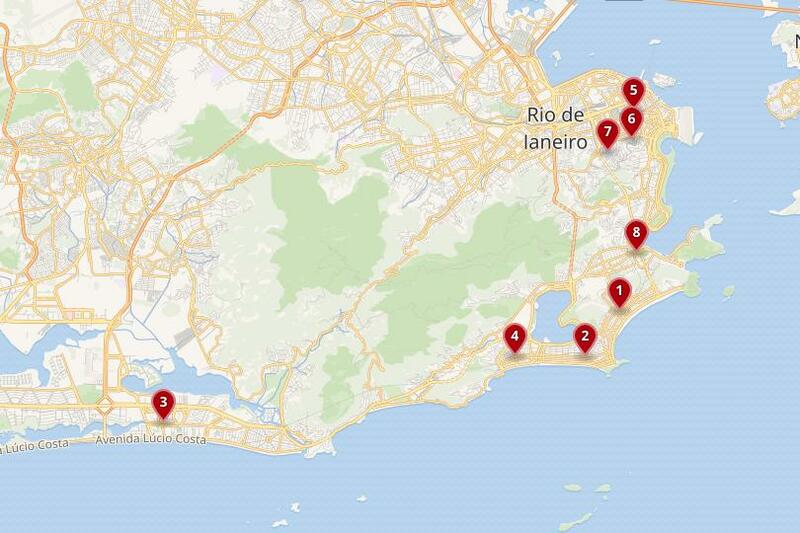 Plus, with three metro stations, it’s easy to get to other areas of Rio. Belmond Copacabana Palace – True to its name, this luxury hotel is set in a palatial building with a selection of spacious, lavish rooms to choose from. These come equipped with hardwood floors, floral fabrics, and classically elegant furniture. Original artworks are on display throughout the hotel, which also boasts a tennis court, a number of chic restaurants, as well as an outdoor pool to sip a few cocktails. What’s more, the grand Belmond Copacabana Palace is located mere steps away from the famous Copacabana Beach itself. Hotel Atlântico Rio – A gleaming, modern hotel set in a glass fronted multi-storey building that overlooks Copacabana Beach, this hotel is also conveniently situated near to Cantagalo metro station which makes getting around Rio a breeze. The rooms here are contemporary and laid-back, and feature white tiled floors, wood panelled walls, and warm, stylish bathrooms. There’s a rooftop terrace here where guests can enjoy splashing around in the outdoor pool against the backdrop of city views, plus an onsite restaurant which also serves up a daily buffet breakfast. Américas Copacabana Hotel – This 4-star hotel boasts views of the famous mountains of Rio de Janeiro from its rooftop sun terrace, making it a great place to relax after a day of exploring the city. The rooms at Américas Copacabana Hotel are done in warm colours, with striped wall paper, subtle lighting, large windows, and modern bathrooms. Guests can enjoy blissful drinks at the cocktail bar and meals at the restaurant, plus there’s also a gym here for keeping up with those workouts. It’s just a five-minute stroll to the beach from this hotel. Hotel Rio Lancaster – The rooms at this hotel are bright and airy, thanks to the large windows and calm, neutral colours – all of it allowing the beautiful views out across the beach to take centre stage. Some rooms even come with balconies, too. There’s an onsite restaurant offering up a buffet breakfast each morning. Other perks include a guest lounge as well as a 24-hour reception, so you can check in (or out) at your convenience. The beach is just opposite this hotel, and Rio Sul Shopping Centre is in easy walking distance, too. Famous for its incredible beach and of course the iconic song about the ‘Girl from Ipanema’, this area truly entices visitors with majestic sunsets, natural mountainous landscapes, and rolling waves. A new crowd has moved into Ipanema, and whilst Copacabana is known for its glitz and glam, the young crowd has taken to hanging out in the relaxed atmospheres of the many bars and restaurants in this area of Rio. Ipanema beach is backed by Dois Irmãos (two brothers peak) and is a well-known spot to watch the sunrise. 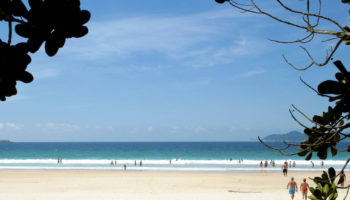 Locals arrive early and spend all day on the sand, soaking up the sun and cooling off in the sea. Along the beach, anything you might need is on sale from the vendors who call out to get sunbathers attention – from cold drinks to bikinis. And there’s always a spot of surfing or a beach game to try out. Ipanema is one of the most sought-after neighborhoods in Rio and, whilst there are luxury hotels that boast rooftop infinity pools, there are also some good mid-range, self-catering options, along with affordable budget hostels just a few streets away from the sand. 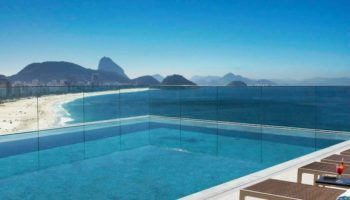 Hotel Fasano Rio de Janeiro – A sumptuous and chic place to stay, guests can positively lap up the views of the surrounding mountain from the lavish rooftop infinity pool. The rooms at Hotel Fasano Rio de Janeiro, some of which feature balconies, are cool and contemporary, decked out with designer furniture, leather sofas and supremely elegant wood panelled walls. Amenities include a fitness center, a sauna, a bar, an Italian restaurant, and even a nightclub. Ipanema Beach is quite literally across the street from this 5-star hotel, which is also close to General Osorio Square. Arena Ipanema Hotel – Set back just 100 meters from Ipanema Beach, the interiors at this hotel are all about celebrating the famous beach itself; they feature light wood walls, as well as artwork depicting Ipanema. There’s a small rooftop pool for guests to enjoy here, as well as a gym, whilst you can also have a few drinks at the hotel bar and tuck into a hearty buffet breakfast in the morning. Arena Ipanema Hotel isn’t just close to one beach, but two: Arpoador Beach is within just a few minutes’ walking distance from here. Hotel Vermont Ipanema – With its laid-back rooms this is a simple, unfussy place to stay. The selection of rooms here includes tiled floors, basic but stylish furnishings, and colourful fabrics to contrast against their otherwise neutral palettes. The hotel itself also comes complete with spacious lounge areas as well as an onsite bar that serves up drinks and snacks. Each morning there’s a buffet breakfast to look forward to, as well. Less than 300 meters away from Ipanema Beach, this 3-star offering is also close to General Osorio metro station for extra convenience. Known simply as ‘Barra’, this western neighborhood of Rio de Janeiro is the wealthiest in town. 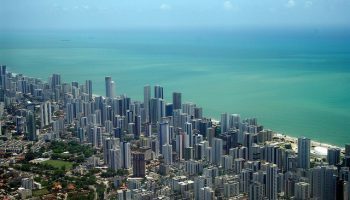 In fact, it’s one of the most developed places in Brazil, having been built to more recent Modernist standards, and features wide, leafy boulevards and high-rise buildings. 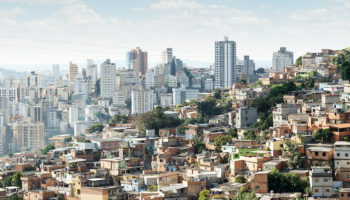 One of the safest high-class barrios in Rio (possibly down to its lack of favelas), here is where you’ll find the city’s wealthy citizens and celebrities living in luxury condos complete with lakes, groves, spas, and gyms. The mini-neighborhood Peninsula is one of these; it’s the newest development in Rio and the first environmentally-friendly one. Also home to many administrative, government and financial buildings, Barra de Tijuca is surprisingly affordable when it comes to hotels; you’ll find a few very nice mid-range options dotted all around the barrio, but there’s a large concentration in its most easterly area – closer to Rio’s center. 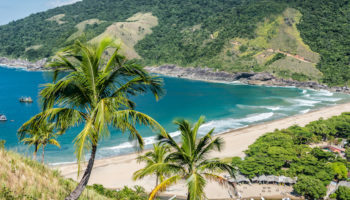 Windsor Marapendi – Set on Barra da Tijuca itself – and just a kilometre from Barra Shopping Mall – Windsor Marapendi is a large, luxury hotel that’s the perfect place to soak up views of the beach and ocean. That’s right, the rooftop area – equipped with a pool and sun loungers – looks out over all the sparkling coastal goodness that Rio has to offer. Unwind in the sauna, work up a sweat in the fitness centre, or dine on delicious delicacies at the hotel restaurant. Rooms feel warm and cosy with big beds, wooden details, and windows that let the views do the talking. Tropical Barra Hotel – Warm and eclectic sea-view rooms, accented with colourful artwork and stone floors, make Tropical Barra Hotel a comfortable place to stay. The rooftop terrace at this 4-star offering features a pool and a hot tub, boasting views of Barra da Tijuca beach – which is just a stone’s throw from the hotel. There’s a restaurant at the hotel too, where guests can also enjoy drinks in the evening, plus a fitness centre for those keen to keep up with their workouts. Nearby you’ll also find many options for eating and drinking Rio style. Hotel Praia Linda – Hotel Praia Linda features affordable rooms with beach views and, in fact, is situated just a few steps from the sand itself. Fun tropical artwork adorns the walls of the rooms, which are otherwise simple and unfussy for a comfortable and clean place to stay. Amenities at this hotel include a street side terrace, as well as a stylish, contemporary restaurant which has been decorated by local artists, where you can enjoy meals complete with sea views. The plethora of shopping opportunities at the aptly named Shopping Downtown is within easy walking distance. Leblon shares the same four-kilometer stretch of crescent-shaped coast with Ipanema and is home to some of Rio’s wealthiest inhabitants. The beach, and sea, here is calmer so it’s more popular with families. Prices in Leblon are not cheap and are often in line with major cities like London or New York. 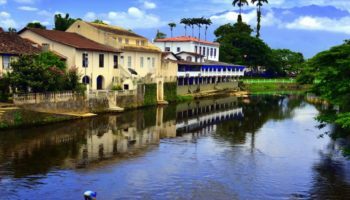 That doesn’t mean that Leblon isn’t worth taking a look at though; the area oozes glamour and is the place where the gorgeous people go to be seen. For high dining and extravagance, Rua Dias Ferreira in Leblon is not to be missed. Dress to impress and head out to one of the many restaurants along this leafy boulevard, then finish up with cocktails at a bar or two. Prices here are high, however. 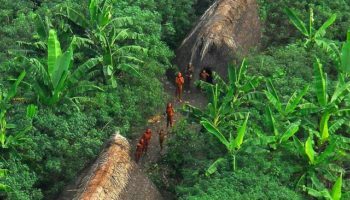 Hotels are suitably deluxe in this district and if you’re traveling on a budget, it’s probably best to look elsewhere. But if you’ve got the money to spare and want to luxuriate in a Leblon hotel, the accommodation ranges from apart-hotels to design boutique hotels. Sheraton Grand Rio Hotel – This Rio-based Sheraton offering serves up a hefty portion of high-end style and luxury. There’s a wide choice of rooms available here, from classic rooms all the way spacious suites – all of which are decorated tastefully with subtle soft furnishings. The hotel is decidedly sophisticated throughout and is located right on Leblon beachfront. This makes for gorgeous sea views whilst dining at one of the hotel’s restaurants, one of which is on the 26th floor. There’s also an outdoor pool with sea views, as well as landscaped gardens too. Old and new fuse in Rio de Janeiro’s downtown for an exciting and fascinating mix. Nestled between the shiny new skyscrapers and high-rise tower blocks are centuries-old historical monuments; there’s the 17th-century São Bento Monastery with beautiful Baroque details, and the exquisite former palace, Paço Imperial, dating from the 18th century, to name just a couple. Today, aside from all the history and culture, Centro is Rio’s financial and business heart, thronged with the headquarters of some of Brazil’s biggest companies. Most of Rio’s tallest buildings are located here, too. As such, this place is busy with office workers from Monday to Friday. When that all gets too much for you, head to the 18th century public gardens of Passeio Público for a stroll. Hotels here are mostly mid-range with a few budget options. They have less charm than others in Rio, but Centro has its perks: it contains Brazil Central Station, so if you’re planning to move on within Brazil by train, it’s a good place to base yourself. 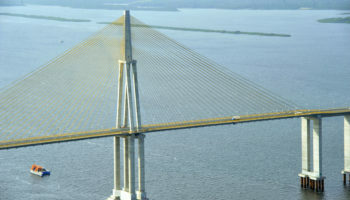 Plus, it’s got good links to the airport from here. And if you’re stuck for nightlife – though there are some old-timey bars here – you should head south to the neighboring enclave of Lapa! Américas Granada Hotel – Decorated around a calm, neutral colour palette, the rooms at Américas Granada Hotel are spacious and provide a relaxing place to stay in the city. These feature parquet floors, enormous beds for a good night’s sleep, and some come with seating areas for extra room to spread out. There’s a chic rooftop swimming pool – complete with skyline backdrop – and a fitness center here, plus a restaurant and bar that serves up dinner and drinks until late. 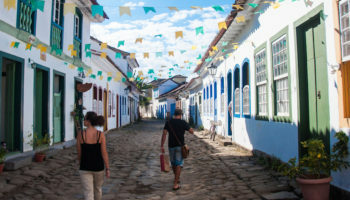 Locals and foreign visitors combine in the lanes of Lapa to soak up its bohemian atmosphere and party hard in Rio’s flamboyant Downtown district. Home to a symbol of the city, the Carioca Aqueduct – known as Lapa Arches – its romantic colonial mansions have become the backdrop for Rio’s free-spirited party atmosphere. Colorful and bold, Lapa is all about the good times. Away from the beach bods and fine dining, Lapa’s crumbling facades have been transformed into trendy bars and busy nightclubs, where all the electric energy of the city can be felt. As the area has become more gentrified, it’s become a safer place for all different types of people to join together and enjoy the nightlife. You can never have an early night in this dramatic and wild neighborhood. Grab some tasty tidbits from one of the tents in the Lapa Arches and then see where the night takes you – just make sure to leave your valuables back at the hotel. Accommodation in Lapa is affordable and you can find yourself bagging a really nice hotel room for not too much money, meaning more cash to spend on going out and having a good time. Hotel Atlantico Prime – Hotel Atlantico Prime is in a perfect position to lap up the bohemian nightlife that the centre of Rio de Janeiro is famous for. There’s a choice of rooms available at this 4-star offering that provide a sleek and sultry, yet comfortable and cosy place to stay, complete with modern bathrooms with marble accents. With a chic, modern lobby and a trendy onsite restaurant serving up a variety of dishes, this hotel is a certainly a stylish option. Attractions like the Modern Art Museum are nearby, but this hotel is also well placed for getting to and from the airport just over two kilometers away. Casa Nova Hotel – Equipped with a fun rooftop pool area and terrace bar, Casa Nova Hotel is a great option for those who are looking for an affordable yet design-conscious stay in Rio. The rooms here are simple but stylish and boast wooden floors, patterned wallpapers, and crisp, white linens. There’s a restaurant onsite that serves up a daily buffet breakfast, but there’s plenty to eat and drink on the doorstep. Also, the nearby Bonde tram stop makes it easy to get around whilst Rio de Janeiro Cathedral is also close. Charming Santa Teresa is a hilly district that’s all historic buildings, colorful trams, winding streets and an atmosphere that’s decidedly village-like. 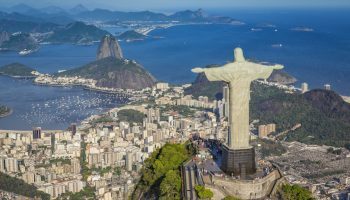 Feeling a world away from the beachside barrios of the city or the bustle of Rio’s downtown, this district also is home to the most famous icon of the city – Christ the Redeemer. Away from that statue – and world wonder, don’t forget – you’ll find a lot to like about Santa Teresa. Hip cocktail bars and boutique hotels are now housed in old villas and mansions that give this place an effortlessly cool vibe; elsewhere, those old edifices have been repurposed into museums and art galleries. There’s even the interesting Ruins Park, located in the crumbled, tumbledown ruins of an Old Republic mansion. Attracting intellectuals, artists and generally wealthy bohemian characters from Rio de Janeiro, this place is known for its political thought as much as it is for its great cafes and sophisticated gastronomic scene. Mama Shelter Rio De Janeiro – A funky hotel to match the bohemian area itself, Mama Shelter Rio De Janeiro is a fresh and fashionable place to stay just ripe for your Instagram feed. It’s a kooky cocktail of colourful fabrics, varied textures, and vintage furnishings accented with houseplants and a sense of tasteful style. Live music is on offer at the onsite bar, and there are Brazilian dishes and pizzas up served up at the hotel restaurant. 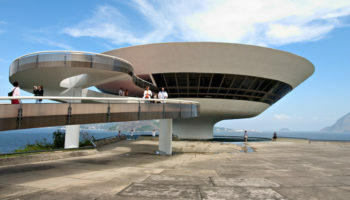 The famous Escadaria Seleron, as well as the Samba Museum, are nearby. Hot, hip and on trend, Botafogo is having a moment right now. Overflowing with funky coffee houses and hipster hangouts, Botafogo isn’t well known with tourists, who usually head for Rio’s famous beaches. But with an alternative scene and lots of young people relocating here for cheaper rent prices, the area is well on the up. There’s a low key, welcoming atmosphere in the neighborhood, which makes it a great place to stay if you want to learn more about local life and be among the entrepreneurial and edgy young people of the city. The area also has great transportation and you can zip around to many of the Rio’s main neighborhoods fairly easily from here. Cool creatives have made the residential area their home, and with a host of co-working spaces, bakeries, and bars, there’s a growing range of budget accommodation on offer that reflects the same fun, forward-thinking style of the district. Yoo2 Rio de Janeiro – This luxury hotel comes complete with views of the famous Sugar Loaf Mountain from its varied rooms – from minimalist chic to contemporary and eclectic offerings. Large windows look out across the city and the floors and ceilings are adorned with patterns. Luxurious spaces to unwind in are abound throughout the hotel, such as comfortable seating areas to dive into a book, as well as a rooftop pool area, and a cocktail bar. Dinner is served in one of a number of restaurants. It’s a great location for visiting Rio’s most famous landmark: Christ the Redeemer. Ibis Rio De Janeiro Botafogo – This branch of Ibis is an affordable place to stay that works as a perfect jumping off point for exploring the city, but most of all for seeing Christ the Redeemer in all its glory – this wonder of the world is just over two kilometers from its front door. This bright and breezy hotel is an all-round great choice for budget travelers. There’s a colorful on-site restaurant and bar, and funky spaces to socialize in. Rooms here are laid back, clean, and modern and feature dark wooden floors and provide a calm and convenient place to stay.